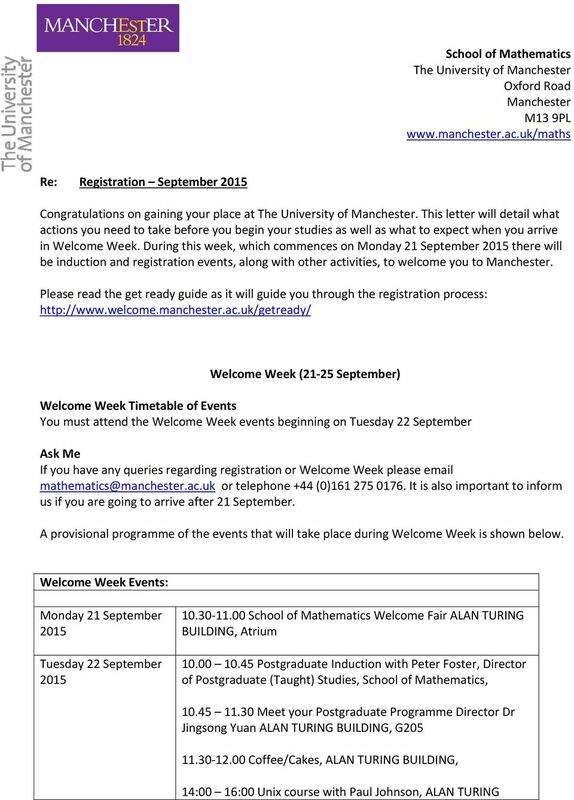 Download "Please read the get ready guide as it will guide you through the registration process: http://www.welcome.manchester.ac." 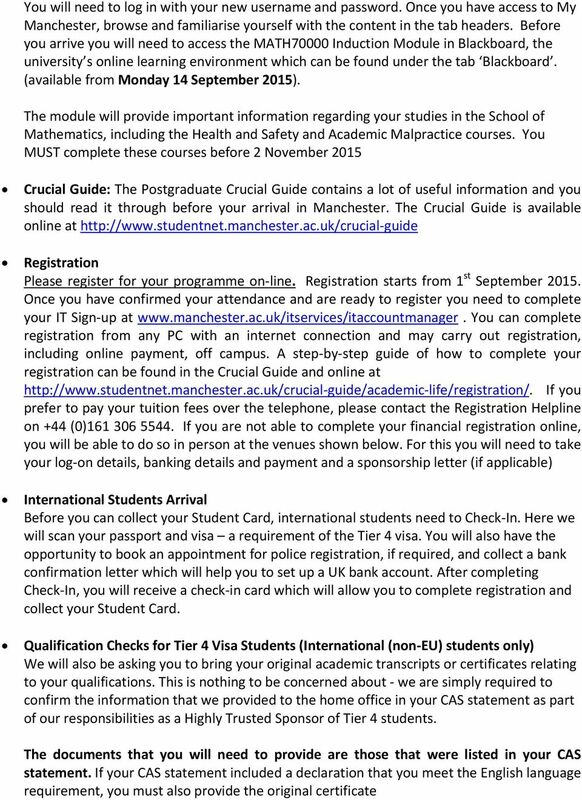 4 Once you have completed registration you will be able to collect your Student Card from one of the following venues. International students will need to bring their passports and ID cards with them to the international check in venue in order to collect their Student Card. 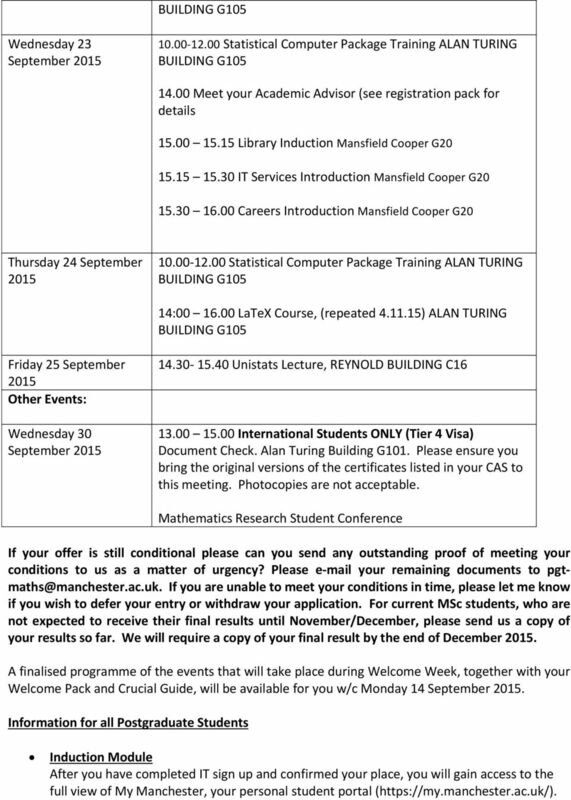 6 and this contains details of all of the events available as part of the programme. PG Workrooms Research Students will be allocated a space in a workroom with a desk and computer within the School of Mathematics for the duration of their programme. Room details and keys will be given to when you come to collect your Welcome Pack. Important information for students funded through the school only (School Scholarships, Industrial Bursaries) Tuition Fees If you were notified of a funding award, the School of Mathematics will be making arrangements to pay your tuition fees. Please contact immediately if you have any problems with your funding from the School. Maintenance Allowance If you were awarded a stipend to cover the cost of your maintenance, you will be paid at the beginning of each month by direct debit into your personal bank account starting from October. 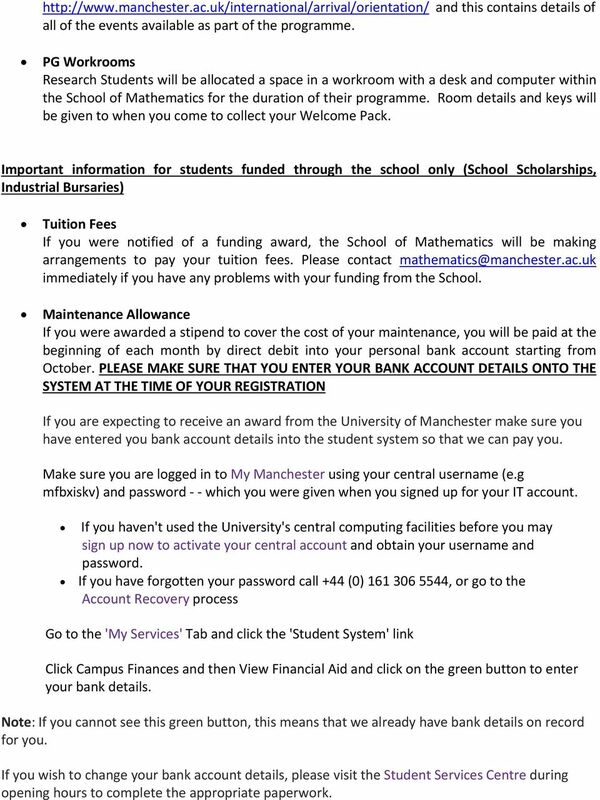 PLEASE MAKE SURE THAT YOU ENTER YOUR BANK ACCOUNT DETAILS ONTO THE SYSTEM AT THE TIME OF YOUR REGISTRATION If you are expecting to receive an award from the University of Manchester make sure you have entered you bank account details into the student system so that we can pay you. Make sure you are logged in to My Manchester using your central username (e.g mfbxiskv) and password which you were given when you signed up for your IT account. If you haven't used the University's central computing facilities before you may sign up now to activate your central account and obtain your username and password. If you have forgotten your password call +44 (0) , or go to the Account Recovery process Go to the 'My Services' Tab and click the 'Student System' link Click Campus Finances and then View Financial Aid and click on the green button to enter your bank details. Note: If you cannot see this green button, this means that we already have bank details on record for you. 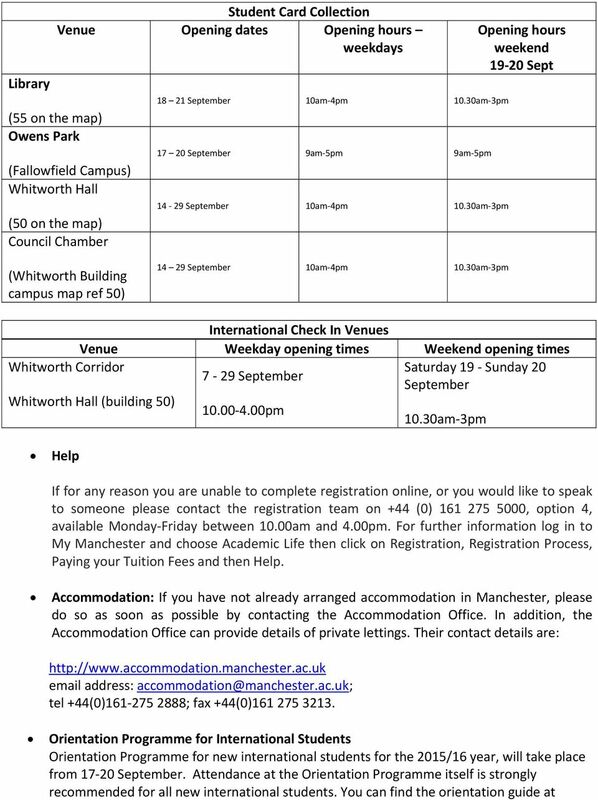 If you wish to change your bank account details, please visit the Student Services Centre during opening hours to complete the appropriate paperwork. 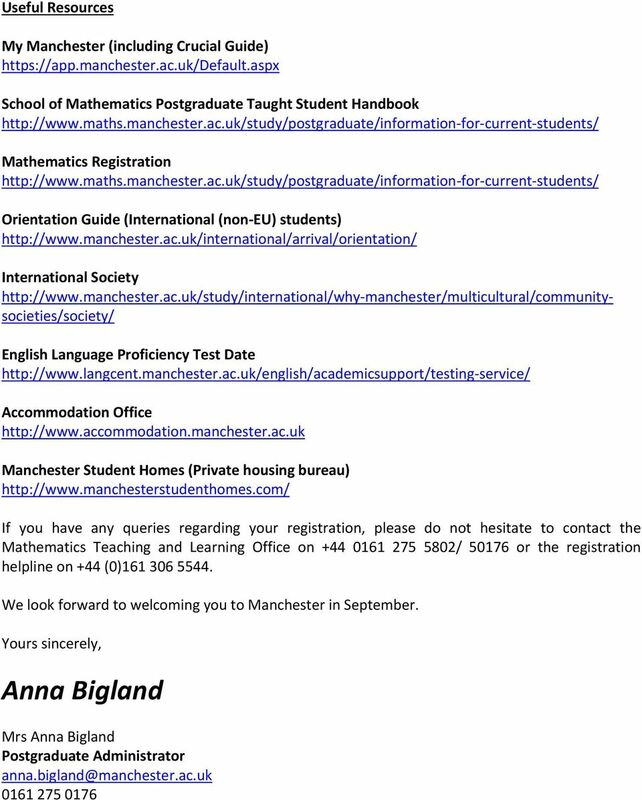 Welcome to The University of Manchester.